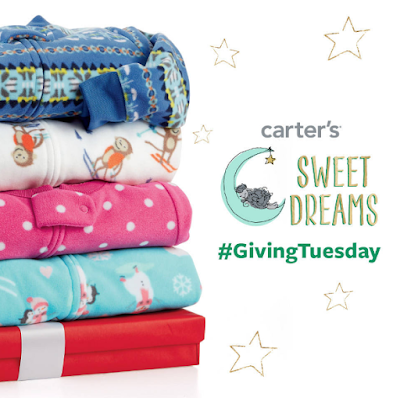 Super Savvy Mommy: Carter's Gives Back on Giving Tuesday! Carter's Gives Back on Giving Tuesday! Today, November 29, parents and holiday gift-givers can feel especially warm and fuzzy about their purchase of cozy Carter’s pajamas this year, thanks to the manufacturer’s donation program. This year marks Carter’s first program, inspired by Giving Tuesday, a pro-social movement that encourages manufacturers and other participants to support charitable giving on the first Tuesday after Thanksgiving. For every Carter’s pajama purchased online at http://www.Carters.com or at one of Carter’s 650+ retail stores on November 29, Carter’s will donate one of America’s favorite jammies to children in need. With YOUR HELP we can help Carter's help children in need! !